For the past 8-½ years, HVACR Business has evolved into your authoritative resource for running your business. It’s published a multitude of articles on management,finance, leadership, legal issues, marketing and more. Throughout those years, you’ve come to rely on this publication — and website, and eNewsletters — for the very best in business management information. As the new editor, I’m proud to lead in the next chapter of this magazine and it’s brand. Just as you’re hard wired as a business owner to outperform year over year, no matter how well you do, I’ll strive to build on this magazine’s history ofeditorial excellence with practical, sound, thought provoking and cuttingedge content that delivers the management advice you need. I’ve worked with many contractors to solve management issues and difficult business decisions throughout my career as an editor in both the HVACR and pest management industries. This is truly an exciting stage, and the timing couldn’t have been better for my appointment as editor. Summer is finally upon us, it’s stopped snowing here in Cleveland and HVACR contractors are changing their focus from heating repair and replacement to cooling. That also means it’s time for the annual Tops-in-Trucks Fleet Design contest! I first walked in the doors of this office, the tremendous number of contest submissions lining the walls blew me away. Every day I’d spend a little time looking over all the fantastic truck designs, eager to jump in and interview the winners for the cover story. I quickly learned the June issue is one of the most popular issues published all year, and it’s because of this contest. That’s no surprise, really. As a business owner, your passion is your brand and this issue celebrates that passion. Your trucks are your biggest assets when it comes to advertising space. They’re a blank canvas on which you can paint your brand for all to see. You don’t have long to make a lasting impression, so your design had better be good — and trust me, they are. I spent a lot of time looking through previous year’s Tops-in-Trucks issues, as well as previous year’s submissions, and I can attest the designs just keep getting better. Each year, the number of submissions that immediately rose to the top has grown. This year was no different as a majority of our record number of submissions was in the running, resulting in the tightest contest ever. This industry has no shortage of great minds and the amount of creativity you use in your marketing amazes me. 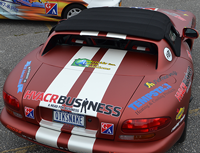 In addition to interviewing our winners, I had the pleasure of interviewing three HVACR contractors who are doing something a little different with their mobile marketing for a feature on page 28 — seeing a Dodge Viper with HVACR logos driving around is definitely something a customer won’t soon forget. Chatting with all of these contractors felt more like having conversations with old friends than conducting interviews. I was immediately reminded of what I like best about this industry: you, the people for which we publish a monthly magazine, website content, eNewsletters, socialmedia and more. You’re the reason this publication has been so successful; and you’re the reason I’m going to continue to make it a success in the years to come.